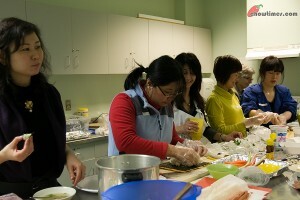 Minoo was very excited to inform me that Ella is going to make Gimbap in the Caring Place Community Kitchen. I had blogged about making kimbap in 2007 in the same kitchen by Minnie. I thought it will be more illustrative if I can video taped the sushi rolling process instead of taking static photo of each step for this post. You must go to the bottom of this post and watch that fun video. 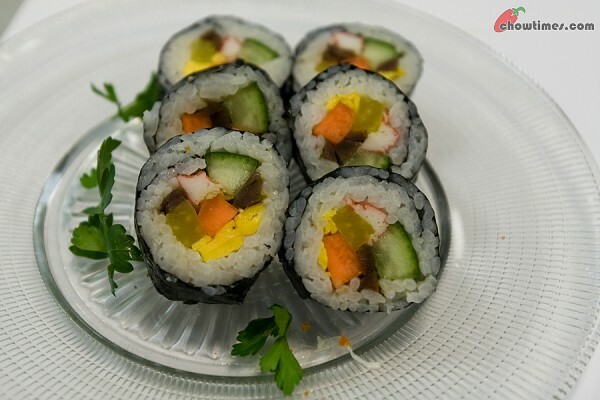 Gimbap or kimbap or Korean sushi is very colourful and has lots of different textures in it. Cook rice with less water than normal as you need the rice to be dry and not soggy. Seasoned the rice with salt, sugar and sesame oil while the rice is hot. 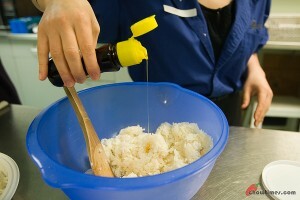 Mix the rice gently (do not press or mush the rice) to blend with seasoning and also to cool down the rice. 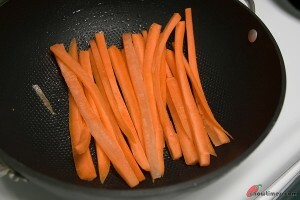 In a frying pan, slightly pan fry carrot until lightly soften. Season with a pinch of salt.Also, pan fry Korean ham. Ella could not find Korean ham and she bought a western sausage as substitute but find it to be too salty. She would rather discard the sausage. To cook the egg, beat a few eggs (like 4) in a bowl. Season with salt and pepper. In a non-stick frying pan, heat a little oil (wipe off excess oil with paper towel as too much oil will make the omelet puff up) on low heat, pour enough egg mixture to cover a thin layer. 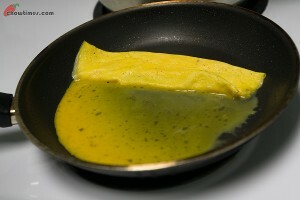 Let the omelet set and roll it up, leaving the roll at one end of the pan. Pour more egg mixture to the pan and tilt pan to cover evenly. 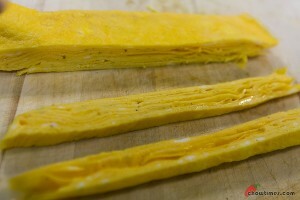 When the new layer of omelet set, roll up using the previous roll as the base. Repeat for 4 or 5 times until the egg mixture are used up. The result is a multilayer egg roll. Slice the egg roll into long strips. 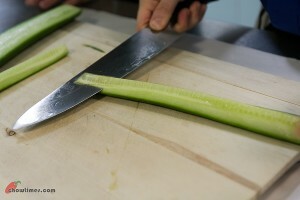 Cut the cucumber into long strips and remove the seeds as the seeds portion is watery. Notice that everything is cut into long strips. 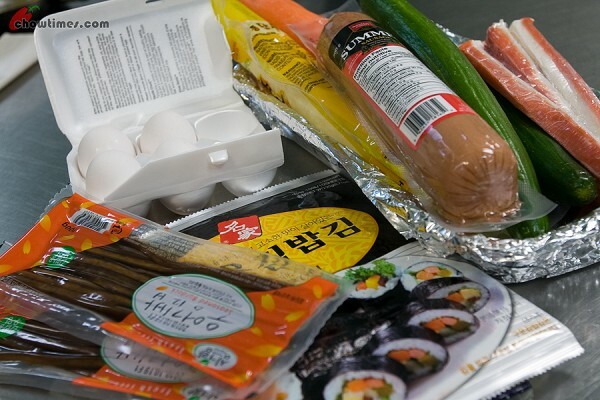 This is a great demonstration as all the participants can have hands on rolling the gimbap.One note here, you can use water to seal the sushi roll or mash up some rice as glue to seal the roll. Ella prefers to use rice. 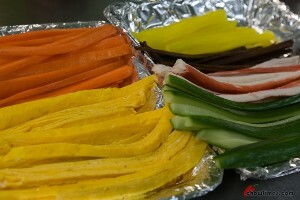 The above is the video of rolling gimbap by Ella. Heh… to be fair, a lot of Korean food are high in sodium. I think the average daily intake is three to five times more what is recommended by the WHO. Yet somehow they live longer than we do. A Korean friend of mine suspects that it’s due to the daily activities they do… the more active you are, the more your body demands sodium. OMG! I don’t even want to think what the sodium content of this must be. I had it once in Korea where it was very popular for 1000 won (about $1) per roll and while it was tasty, the after taste of salt was over powering. Never again. There are so many places in Vancouver that sell take-out sushi. Are there any places that sell a good tasty take-out Kimbap? KIMBOB E RAMYUN — 423 Seymour Street, 604-685-2877 — Open Monday to Friday 10 a.m. to 8 p.m., Saturday 10 a.m. to 7 p.m. Closed Sundays and holidays.